A commercial fisherman, organic farmer and inventor, John Miedema first came across biochar about five years ago when he was researching better ways to clean up effluent from a dairy manure digester. Miedema grew up around dairy farms and he remembers how the manure cesspools would foul the streams. He wanted to do things differently and he figured charcoal would work well as a filter and perhaps also serve as a substrate for beneficial microbes that would help retain nutrients. Researching “charcoal” and “manure,” he found that native Amazonians had discovered this technique thousands of years ahead of him. Miedema quickly realized that biochar could not only make a dairy operation more sustainable, it could also help with climate change. The reality of climate change had come home to him years earlier when he was working as a commercial fisherman. “We started catching some really strange fish – I could see that the ocean was changing,” he said. 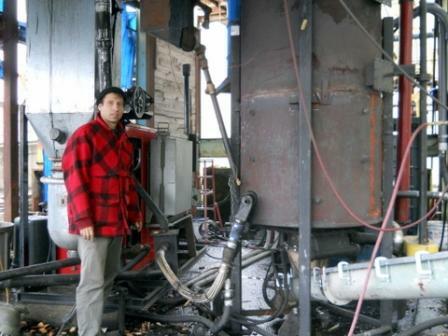 In 2009, Miedema started the Pacific Northwest Biochar group and organized a meeting at Oregon State University followed by a conference at the Pacific Northwest National Lab, which brought many researchers and biochar entrepreneurs together to share information and ideas. Because sustainability is his number one concern (“I have children who need to have a future,” he said), Miedema and his wife, Tracy, started drafting Sustainability Protocols for biochar. Tracy serves on the National Organic Standards Board (NOSB), giving her a strong background for this effort. The current version of this document is posted on the IBI Sustainability page. Miedema’s next move was to figure out a way to make his own biochar. He contacted Thompson Timber Company and Starker Forests, Inc., two local companies that had forestland and a good supply of low-grade woodchips for biochar feedstock. They also had a large mill site with plenty of room, and best of all, lots of salvage material from old machinery that could be repurposed to fabricate biochar kilns. The owners were interested in Miedema’s ideas partly because they needed better markets for their wood chips, but also because as family-owned forestry businesses, they have a long-term view and are concerned with the health of their soils. Thompson Timber hired Miedema as their Director of Biomass Energy and turned him loose on the mill’s pile of industrial junk that he likes to call “industrial Lego”. Although Miedema is satisfied with the retort he constructed from a 9-foot high fuel tank and other scraps with the assistance of Gary Wilson, an experienced metal worker, he remarks that “If I had money, I would have built this differently.” Miedema did not want to use any propane or other fossil fuels to fire the retort, so his friend, engineer Tom Miles, helped him find a used Fluidyne Pacific Class gasifier to make gas from wood chips and fire the retort. The result is a fossil fuel-free hybridized system using gasification as the thermal drive for a pyrolytic retort. It is a semi-batch process with several different operating modes that allows Miedema to make different kinds of biochar under different temperature regimes using different feedstocks. The kiln was inaugurated in June 2010. With the capacity to make 100 pounds of biochar an hour, Miedema began his next project: biochar markets. To better know his product, Miedema turned to his research connections to help him find answers. For their part, biochar researchers at the US Department of Agriculture (USDA) and Oregon State University were happy to have a source of biochar made under controlled conditions for their experiments. Miedema is actively engaged with the researchers, helping coordinate some of the research projects and learning from the results how to make biochar with specific properties for specific purposes. Much of this work has been done with Dr. Markus Kleber at Oregon State and it ranges from basic characterization work to testing applications of biochar as a vermiculite substitute in potting media, biochar as a substrate for green roofs, and biochar use in storm water cleanup. Miedema found an answer to his original question about manure when USDA researcher Hal Collins used his biochar for phosphorus recovery in sewage lagoons and had good results. Miedema has also supplied biochar and advice to several companies, including Sunmark, which uses biochar in its Permamatrix product for erosion control and land remediation. This period of exploratory market development work is crucial in Miedema’s eyes because he needs to find the markets that will allow him to scale up his work. To construct a one ton of biochar per hour plant, he will need to raise $1.5 million in capital, and that means he has to prove the market. Although Miedema has been skeptical of carbon finance for developing biochar projects, he was happy to help when Peter Weisburg of the Climate Trust asked to use the Thompson Timber project as a case study for a California Energy Commission analysis evaluating whether biochar projects could qualify as carbon offsets. “I wanted to prove that my biochar system would meet all the requirements for a carbon reductive project,” he said. The report was favorable concerning almost every aspect of the Thompson Timber pilot project (energy balance of the process, life cycle of the feedstock, biochar use) except for the scale of the project. In order to qualify as a carbon offset and justify the expense of monitoring and record keeping, the Climate Trust report concluded that the project would need to scale up from about 8 tons of biochar per year to 2500 tons of biochar per year. The challenges of monitoring the end use of the biochar in soil also favored a large, vertically integrated project. The results confirmed to Miedema that his approach of demonstrating all of the other more tangible and immediate values of biochar is a better development path, especially for the small producer. “As producers we can make a better case to consumers about the value of our product by confirming through full Life Cycle Assessment that biochar is sustainable while it builds healthy soils and purifies water,” he said. Miedema and his research partners continue their investigation of biochar properties, production conditions and, ultimately, markets. Fortunately, Miedema’s family and employers are supportive of the research and development work he is doing with biochar as they share his vision of a sustainable future. 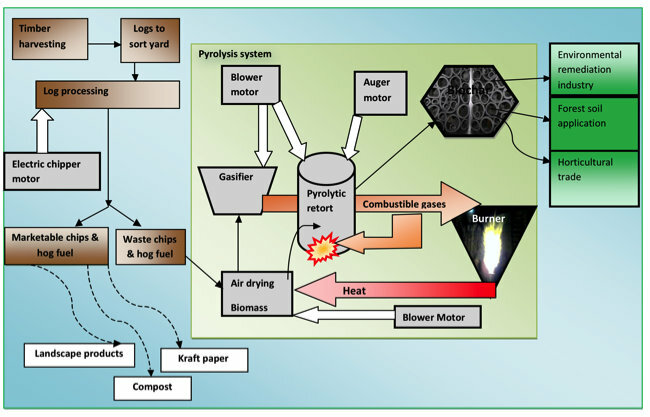 Diagram: Thompson Timber Biochar Project diagram (adapted from Roberts et al 2009). Solid line arrows indicate flows of material (logs, chips, biochar). Block arrows indicate flows of energy (diesel fuel, electricity for the system motors, or combustible gases). Dashed lines indicate current product uses for the wood waste.